The U.S. Wants Snowden. Why Won't The World Cooperate? : Parallels The world has been thumbing its nose at the U.S. government as it seeks the extradition of Edward Snowden, who's accused of espionage for revealing U.S. surveillance programs. 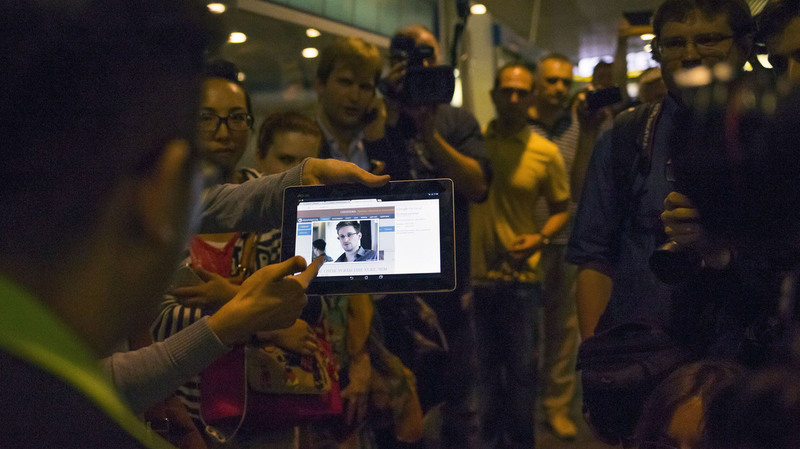 Journalists show passengers arriving at Russia's Sheremetyevo airport on Sunday an image of Edward Snowden. China appeared perfectly happy to let Edward Snowden slip away despite a U.S. request for his arrest. Russia appears to enjoy thumbing its nose at Washington as Snowden cools his heels at a Moscow airport. Ecuador is toying with the notion of granting him asylum. Why is it proving so difficult for a superpower to get a bit of international cooperation over Snowden? He has acknowledged leaking details of U.S. government surveillance programs, and has been charged with espionage and other offenses. President Obama recently met his Chinese counterpart, Xi Jinping, in hopes of setting a positive tone for what is widely regarded as the single most important international relationship. And the Obama administration has often touted its "reset" with Russia and its President Vladimir Putin, though there's been plenty of ongoing friction. Writing in The Wall Street Journal, columnist Bret Stephens sees the Snowden episode as part of a broader decline in American influence. "However the Snowden episode turns out ... what it mainly illustrates is that we are living in an age of American impotence," Stephens writes. "The Obama administration has decided it wants out from nettlesome foreign entanglements, and now finds itself surprised that it's running out of foreign influence." While Snowden plots his next move, here's a look at how Russia, China and Ecuador are handling the case. Russia: As NPR's Michele Kelemen noted on Morning Edition, "it's really PR heaven for Putin. The U.S. often accuses Russia, as it does China, of cybercrimes ... so this really offers Russia a chance to point out what it sees as American double standards." The U.S. government has argued that Snowden pulled back the curtain on American surveillance programs that were designed to prevent terrorist attacks, and that it's not valid to draw comparisons to cyberhacking efforts by other governments. But that argument has not played well in Moscow, Beijing or elsewhere. Putin described Snowden as a "free man" who could choose where he wants to go. And the Russian leader offered this analogy of the case: "It's like shearing a piglet. There's a lot of squealing and very little wool." How does that translate? The Americans seem to think that the Russians have a limited interest in Snowden and may let him leave for another country relatively soon. Secretary of State John Kerry and other U.S. officials are playing down the case, calling it a straight-forward legal request, and not a Cold War-style confrontation. The U.S. and Russia are at odds over much larger and more difficult issues, such as the civil war in Syria and Iran's nuclear program. China: The U.S. was upset that Hong Kong did not detain Snowden while he was there, and says there will be "consequences" for China, though the U.S. has not spelled them out. Snowden's exit from Hong Kong suggested the Chinese leadership preferred for the case to be someone else's problem. But it didn't keep the Chinese media from reveling in the publicity coup of an American accusing his government of spying on China. China's People's Daily praised Snowden for "tearing off Washington's sanctimonious mask." There's also the question of whether Snowden might have passed intelligence information to the Chinese and the Russians. As Michele noted, he's believed to be traveling with thumb drives and laptops full of U.S. government secrets. Ecuador: Ecuador's President Rafael Correa has taken over from Cuba's Fidel Castro and Venezuela's late Hugo Chavez as the Latin American leader who most enjoys tweaking the U.S.
Ecuador's London Embassy took in WikiLeaks founder Julian Assange a year ago, and he remains holed up there, offering moral support and legal advice to Snowden. Ecuador took two months before granting asylum to Assange, and the country's foreign minister said Wednesday it could also be months before any decision is made on Snowden, The Associated Press reported. Taking in Snowden would likely have consequences for Ecuador. The country's trade preferences with the U.S. are coming up for renewal this summer. If Snowden is granted asylum, this would surely anger the U.S. Congress, which must renew those preferences. Ecuador is a member of OPEC, and its oil exports give it some economic protection. Still, increased U.S. economic and diplomatic pressure could make life difficult for such a small nation. Meanwhile, Snowden remained at Moscow's main airport on Wednesday, with no sign that his departure — or his extradition — was imminent.